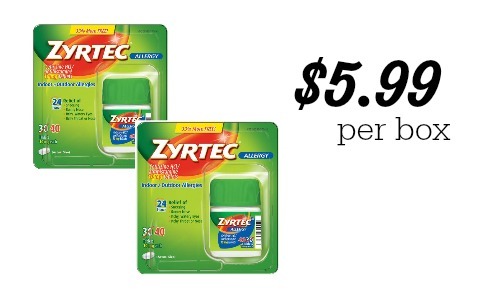 Home > Printable Coupons > $5 off Zyrtec Coupon – Makes it $5.99 at Publix! $5 off Zyrtec Coupon – Makes it $5.99 at Publix! Snag a crazy deal with a new Zyrtec coupon at Publix over the next couple weeks! In the new Publix Personal Care flyer, running through 4/24, you can get Zyrtec 25-30 ct. boxes for as low as $5.99 a box after coupons and a rebate. That’s like paying 19¢ a pill! With a pollen covered porch, this is perfect timing for allergy medicine deals. That makes it $11.98 for both or $5.99 each! This comes out to about $5 a box cheaper than any other price we’ve seen lately! !